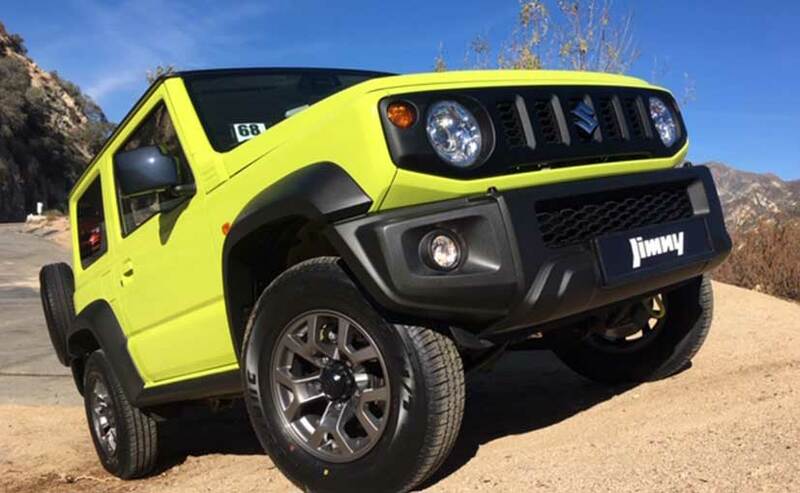 We have the exclusive review of the very hot new 4X4 Suzuki Jimny that is getting attention worldwide for its retro looks and energetic performance. Deliveries for the car will begin in early 2019, but India isn’t getting it. 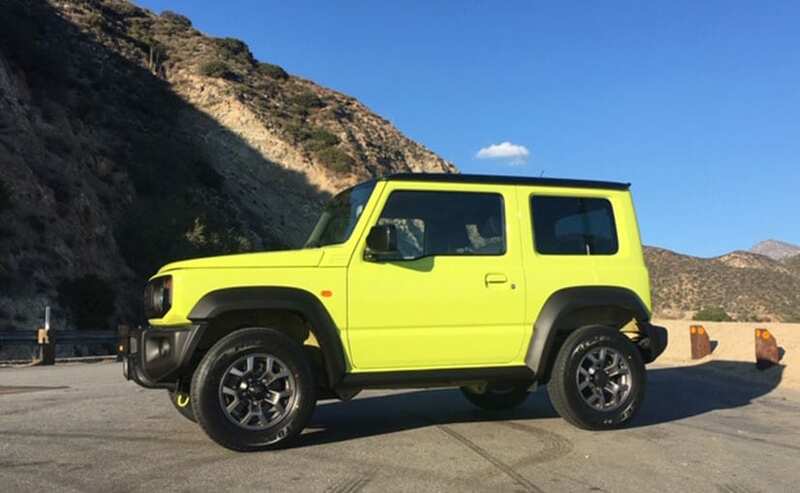 The Suzuki Jimny is one of the Japanese company’s most successful, most daring, and most capable vehicles ever. The car has endured over time, gaining in popularity in several markets where it has been sold since 1970, under different names Samurai, Sidekick, Sierra and Katana. In India we got the long wheelbase of the second generation – called the Gypsy of course. 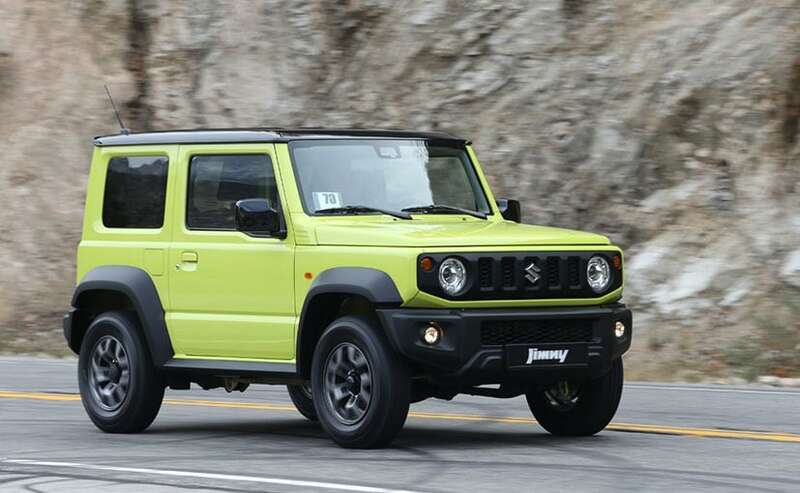 And now the long-delayed and much-awaited fourth generation of the Suzuki Jimny is out worldwide, and is gaining not just in popularity, but also respect. That respect comes from being appreciated for its pure purpose built, true approach. 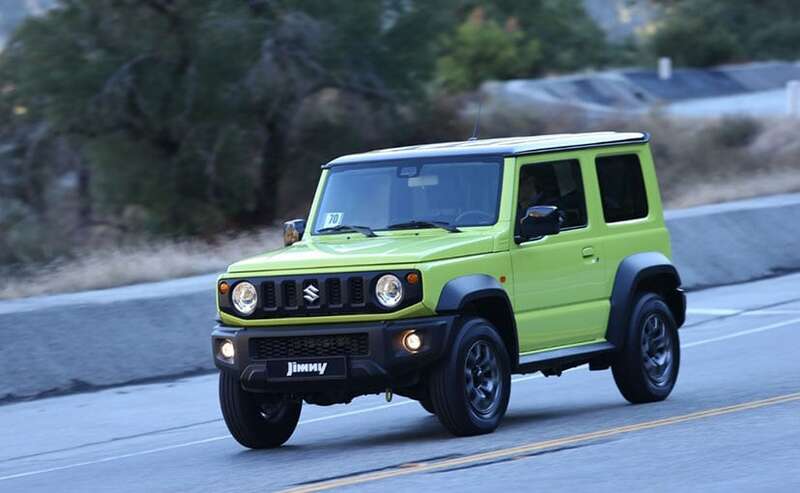 With the Maruti Suzuki Gypsy finally being phased out, leaving millions heartbroken, should Maruti Suzuki reconsider bringing the Jimny to India? And what about it’s existing subcompact SUV play with the Vitara Brezza? I have now driven the new Jimny extensively. So read on to know where I stand on that issue. 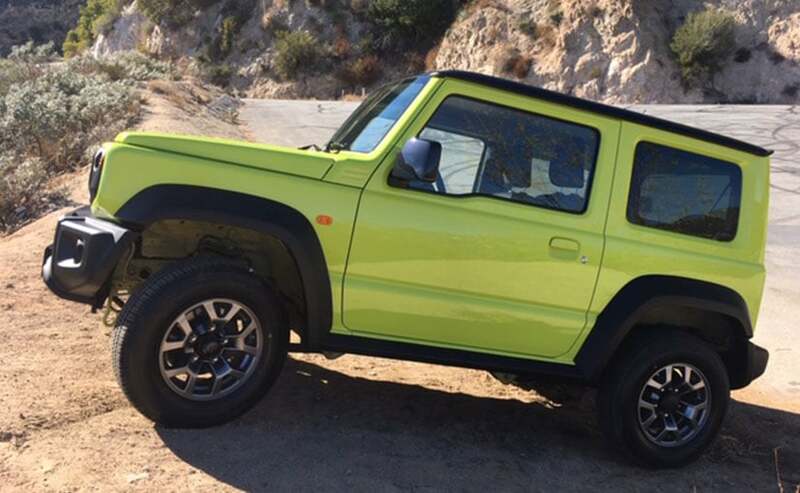 Like its predecessors, the new Suzuki Jimny is also built using a ladder on frame chassis. Step one of staying true. Step two? Keep it 3-door only. And then the crucial next step? A naturally aspirated 1.5 litre petrol mill that churns out 101 bhp and 130 Nm of torque. The gearbox, but naturally, is a manual 5-Speed. 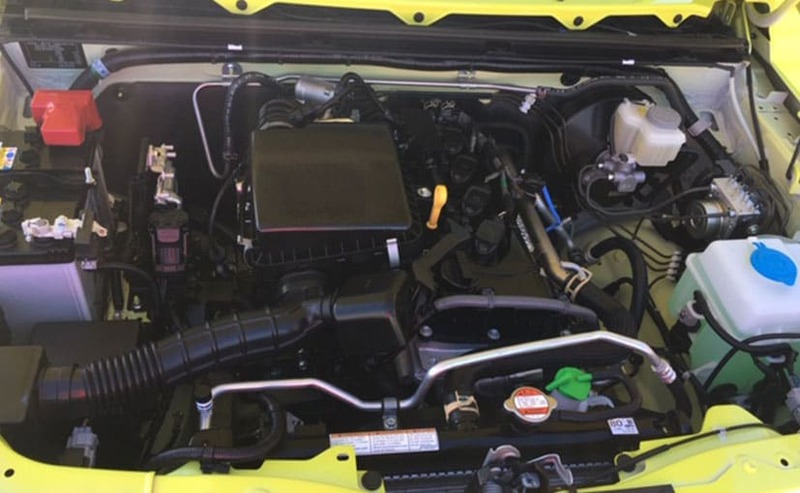 So there is no turbo (therefore no Boosterjet engine – Suzuki’s much touted new range of turbocharged engines) and no fancy automatic. The reason quite simply is to keep the car mechanically as pure as possible, and to afford an effective 4X4 performance. 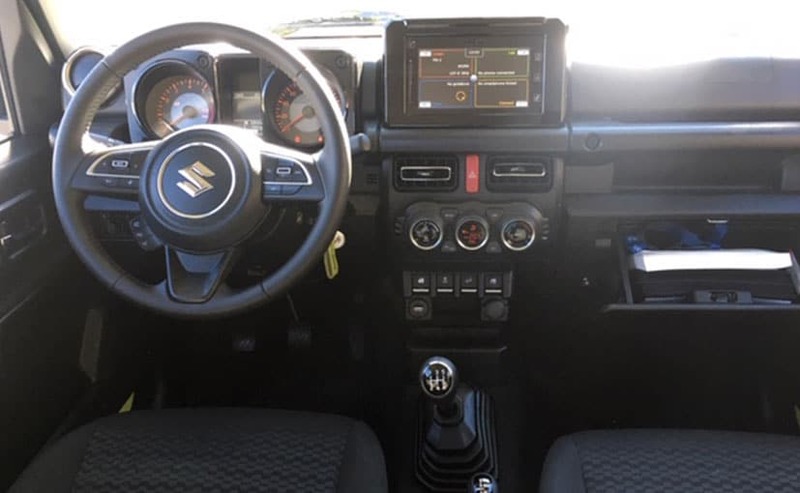 Well to be fair there is a 4-Speed auto box on offer, but no one is likely to touch that with a barge pole – even Suzuki expects no more than ten per cent sales to come from the rudimentary automatic. Steel wheels, a wipe-down interior and fold-flat rear seats. Oh yes, when I said 3-door I was not discounting a second row. Yes its tight, yes its for the kids, and yes you have to keep it folded if you want any rear cargo space of any kind! 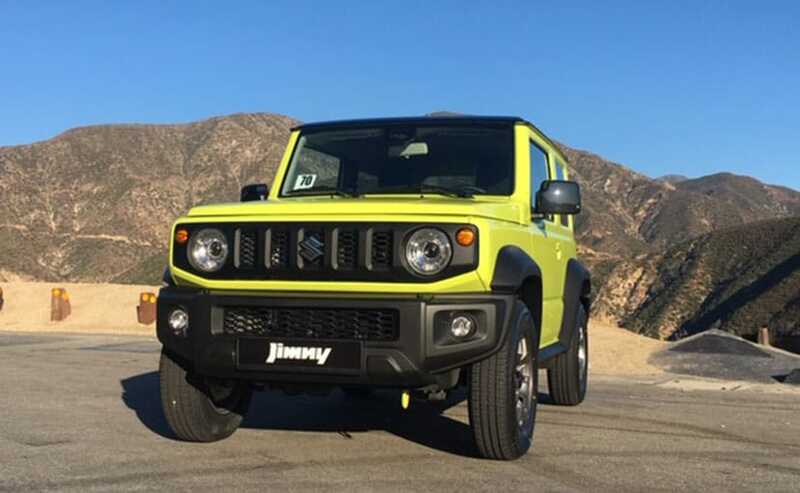 The Suzuki Jimny is taller, wider but shorter than the previous generation model. The car sits tall, having gotten taller sine the last generation. It is also wider, and yet is now also shorter than before, with the front overhang having been reduced to allow for a better approach angle. This doesn’t give it the aerodynamics or handling of the softroaders you may be used to, nope not even an EcoSport! But the large-ish and chunky 15-inch Firestone all-season tyres help keep things sane, and safe! 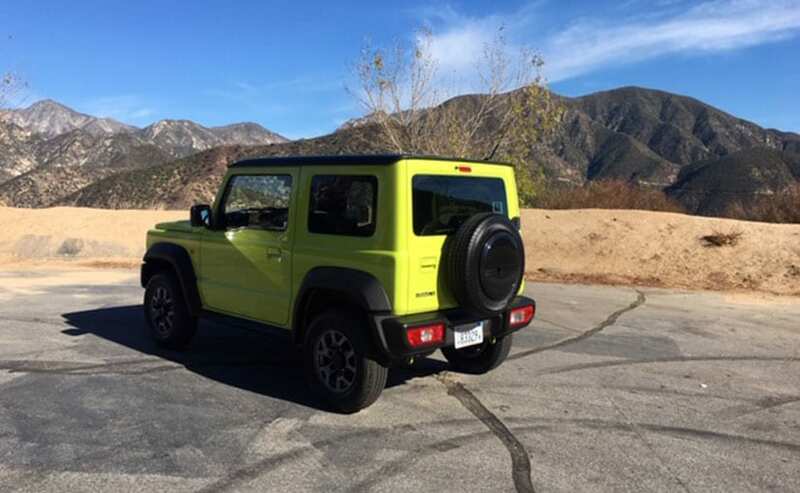 I drove the car in Pasadena, California, then out of the city on a high speed freeway, and then on to the stunning and curvy Angeles Crest mountain road. As soon as I had the car on the road, I realised this is a different animal indeed. The engine is all too loud, the driving posture is all too upright, and the body roll is all too obvious. And yet I was having fun. Is that strange? Perhaps the answer lies in the incessant barrage of me-too type vehicles that are easy, consistent and extremely boring after a point. 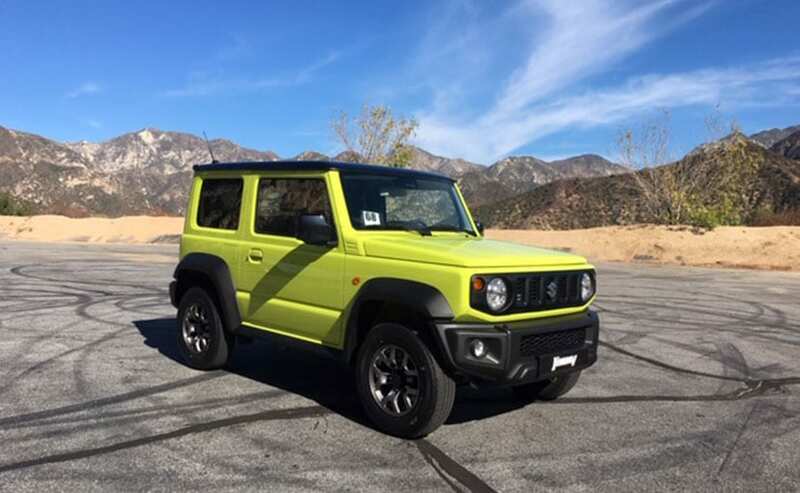 The Jimny is anything but boring. Out on the highway, the Suzuki Jimny’s;engine is all too loud, the driving posture is all too upright, and the body roll is all too obvious. What I believe to be the Jimny’s Achilles heel is the steering. It is slow, too soft and lacks precision. It also has lots of play, and so you find your arms doing more than the driving situation requires, and the response is a tad deferred. What helps though is that this is a tiny car, and so steering loads are never high – even if you have more people in there with you. Also, this is not the car to be taken round corners at manic speeds anyway. Oh did I mention that it doesn’t really go much faster than you’d imagine anyway? Though I have to say, it was a quick fun burst to 80, and then even to 100. 120 was reasonably smooth, and then it is a small struggle to hit 140 kmph – which is pretty much where it tops off. The other fun part of the equation is that manual gearbox. Shifting is light and surprisingly comfortable. 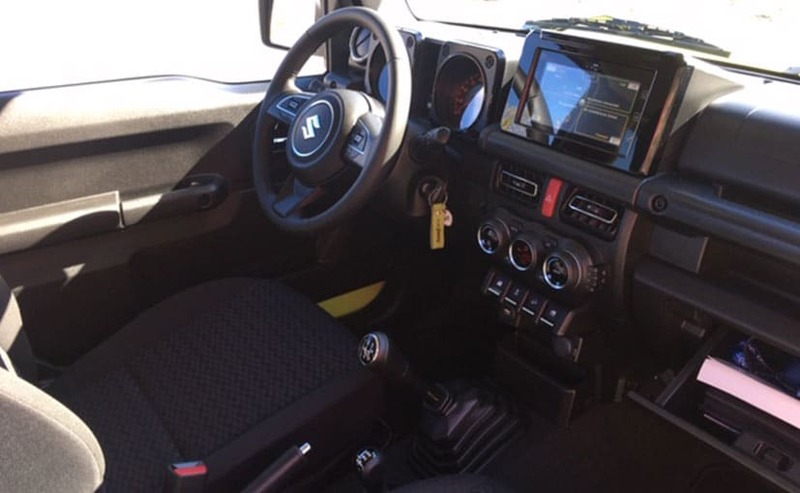 The shifts of the 5-speed manual gearbox on the Suzuki Jimny are light and surprisingly comfortable. Gearing is short, and the changes are a tad slow – especially the pickup from second to third gear. The engine is revvy and almost begs for a sixth gear though, which isn’t there. But that was on my highway stretch and also when I was only operating at speeds above 100 kmph, on a road that seemed to dip slightly on a downward straight stretch. 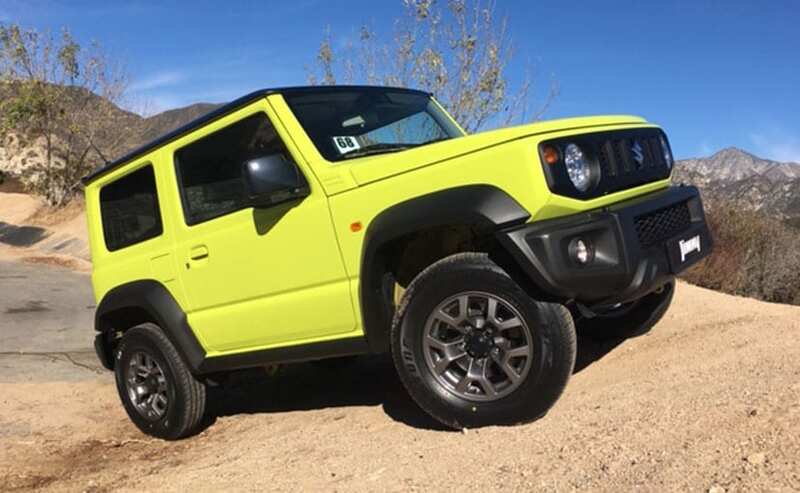 Ride quality is actually really good, and even on the rough, bumpy bits and the American staple of concrete patchy highway, the Jimny holds its own. Given its stance and the suspension setting I had expected the car to bounce around, which it did not. Staying in 2WD is best on the road, though handy on-the-fly 4X4 lever allows the car to go up to 100 kmph in 4WD mode too. But you don’t want that. I was told the car does extremely well off-road with its easy to manoeuvre chassis, approach and departure angles and grunt. So climbing steep slopes, negotiating ruts and slush, and also effective hill-hold and descent control functions thrown in. The low range gearbox also does well here, and I got a very limited yet satisfying test of that when I took the car onto a small mountain trail – that I am not entirely sure was open to the public. Well I did not transgress long, and did get a small sense of the car’s 4X4 prowess – which is impressive. The car with me was a German spec vehicle, and I was driving it in America – which meant a speedometer with kilometres and not miles, and no active navigation system. 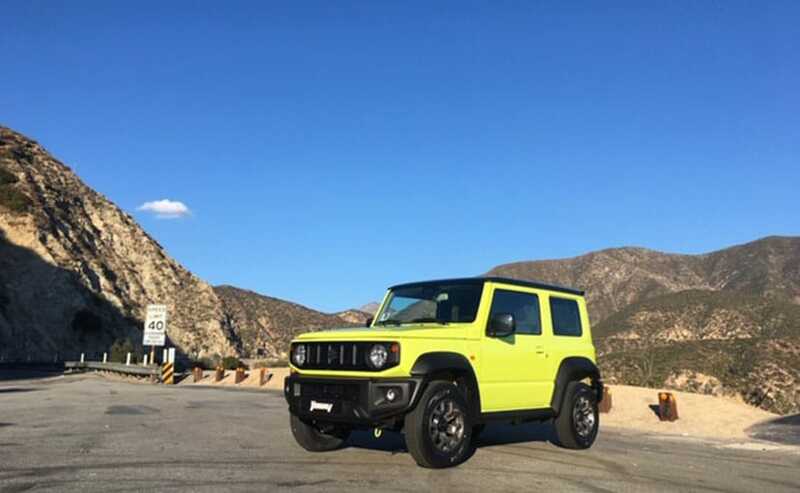 The reason is that Jimny was brought in to the US for a special opportunity that jurors of the annual World Car Awards get to test the year’s nominees. Suzuki pulled its car business from the USA some years ago, and so it was very kind of Suzuki to ship in 3 of them for us. Not being the brightest when it comes to arithmetic or mathematics, I was blissfully unaware of whether or not I was violating the freeway’s 65 mph speed limits by some, or a lot. Luckily Los Angeles and its surroundings see people happily breaching that limit by at least 15-20 mph, so I was relatively safe. I later realised I was doing 75 mph thanks to a handy little sheet that the Suzuki team had very thoughtfully left in the car that told us what 35, 45, 65 mph translated to on the Jimny’s speedo! All the cars were dressed in the very high viz Kinetic Yellow (which I thought looks green and not yellow, but oh well!). 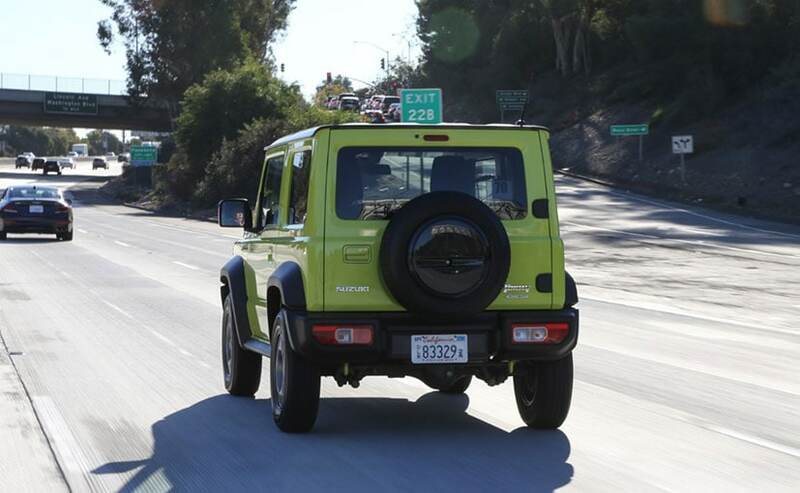 The Jimny will get your attention the second it comes into your frame of view. It’s square, tall and altogether adorable! I think its cheeky retro is what allows it to get away with so much! The round headlights and Jeep-like grille give it a charm and appeal stronger than even the Jeep Renegade for some reason. It is modern in its styling elements without trying to necessarily convey that in an obvious way. It would rather give off a simple, mechanical, utilitarian vibe – which is its styling strong suit I think. The customary rear door mounted spare wheel is part of that ensemble – though you’d better get used to knowing its there when you’re backing into spaces! Yup – you guessed it – no reverse camera or parking sensors! Inside, the cabin is well finished in black. Plastics are simple yet strong, with a similar rough and tough je ne sais quoi about it. The instruments are finished in amber-lit dials from the 1980s, yet have a functional trip and vehicle info screen between them to keep things 2018. That is also true of the very familiar touchscreen infotainment display that we have seen at the top-end of every Maruti Suzuki model over the past 3 years. It’s the very same, and so you know how it works. If you don’t, read our Baleno, Ignis, Vitara Brezza, Ciaz reviews! The seats are upright yet comfortable, with mechanical adjustment, while the climate control (another Maruti Suzuki standard) is effective. 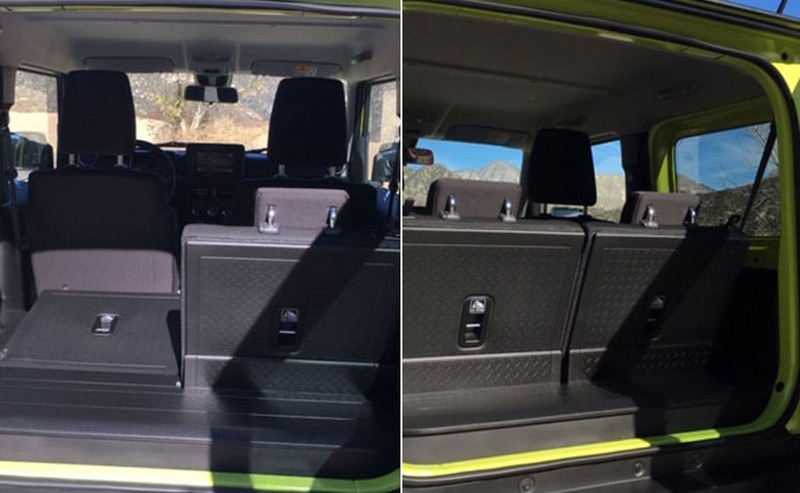 Fold and slide forward the front seats to get to the rear of this tiny cabin. Getting to it is easier from the passenger side, and the seats back there are surprisingly comfortable – given the lack of legroom and space in general. Best for kids, or better yet – best kept folded down in my opinion. Keeping the seats up leaves you about enough space for slim laptop shoulder bag at best – you know that kind that just take your laptop and not much else? So keep the seats down and you get a proper boot. That makes this car very individual, very purpose built, very no-nonsense – and so yes – you’d think very impractical for India. Traditionally speaking I would agree. But look at our recent consumer trends. Millennial and (shudder) post-millennial buyers are anything but traditional. There is a growing breed of younger buyers (and young at heart types!) who want a car that expresses their individuality, and allows them some fun – in spirit or application. 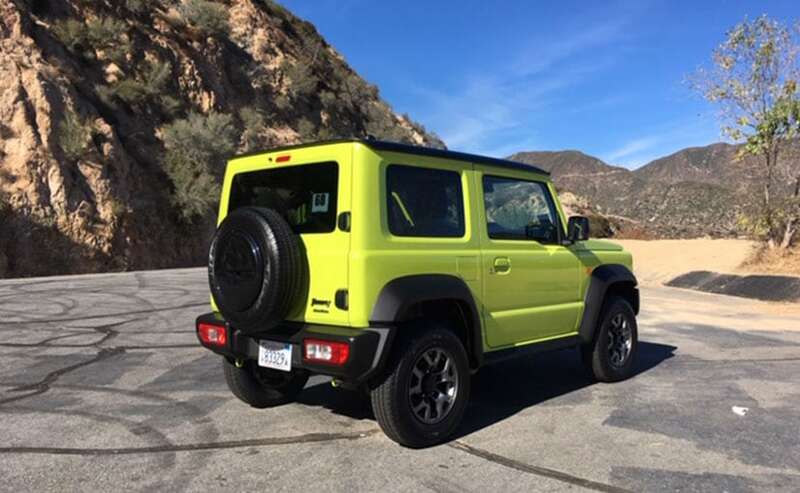 The Jimny is very much THAT car. It is nothing like the Vitara Brezza in look, feel or operation. It is a small, affordable 4X4 for those who want to have some fun off the tarmac, and so could be the very obvious lifestyle model that has always been missing from Maruti Suzuki’s portfolio. It is rugged yet refined and so is like nothing that is currently available in our market. That is why I do believe it could be the right fit for us – in small volumes no doubt – and yet selling alongside the 2 wheel drive only Vitara Brezza. Well, to be fair this would be a Nexa model in my book, and so would not physically sit alongside that car in a showroom! But you know what I meant; so let’s move on! The point is the two cars are extremely different. Now the question is – should Maruti consider it for us once again? And does limited volume mean completely built import, and therefore silly prices? That is not my call to make. But if Maruti looks at selling around 10,000 of these a year, a locally assembled car may make sense. And I think at around 12-15 lakh, give or take 1 or 2 lakhs, it can sell even 20,000 units of the Jimny. The next question is, will the company care – given Maruti’s always strained capacity, which is under pressure to keep the supply of popular models going? Possibly not. But now that the market is down, and Maruti is also under pressure to maintain its share – it is brand shaping vehicles like this one that may help take it confidently into a new era with a greater reputation for being ‘cool’ and appealing to the ever-evolving Indian buyer. And if some nervous Maruti marketing man is reading this and thinking I would buy the Jimny over the Vitara Brezza, yes I would. Cannibalisation alert! But the truth is I would also buy it over a TUV 300, Nexon, EcoSport, Creta, and dare I say – Duster, just as quickly. Those are all family cars in India aren’t they? 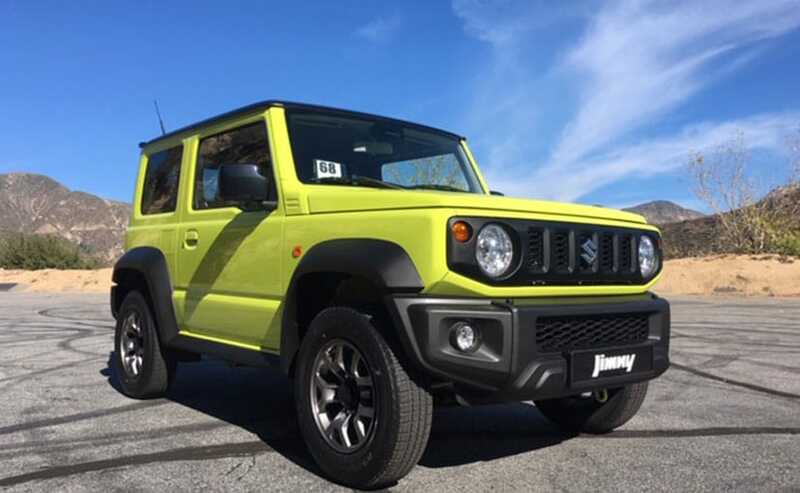 The Jimny is anything but. And no one has dared to go there in India. It’s about bloody time someone did!